Have you ever read this novel? Wow. The determined, judgmental, and self-righteous Mattie Ross is a narrator so powerful she overshadows even Rooster Cogburn, the half-broken U.S. Marshal she hires to find the man who killed her father. The story sweeps right along and Portis never falters in his use of Mattie's distinctive voice. A guy in his forties pulling off first person narration from an 1880s teenaged girl is quite a feat. I'm a guy in my forties and I wouldn't touch that job. No topic in all the topics written about by humans can top Irish politics for complexity. Read Irish history and you'll see that there are more Irish political parties than actual Irish people. Then half of them use Gaelic (Irish) names for their group/movement/party/organization and that doubles the confusion unless, I suppose, you're from Ireland. Nonetheless, Coogan provides as much guidance as humanly possible and brings a powerful storytelling gift to the extremely complex topic and an immense cast of characters. Ballard is one of my influences, and I was surprised and pleased to see this posthumous autobiography. A physician by training, Ballard began his career writing hallucinatory science fiction and some of that, as well as classics like High Rise, have earned respect as literature. As a boy, Ballard lived in Singapore under the Japanese occupation--a time he wrote about in his memoir Empire of the Sun--and in his writing, at least, his view of humanity is not a rosy one. Not that I'm surprised. I've read seven or eight Ballard novels and a bushel of short stories and don't remember ever cracking a smile. His reputation continues to grow in the U.K., and though less known here, a few studies of his work are out there. "[A] panoramic portrait of loss and grieving ... Cunningham’s tenderness and terse prose style announce the arrival of an assured and perceptive literary voice." "The author’s talent for quiet, meditative character studies is on full display in this slim slice of smalltown life." ...is the blog of Kevin Cunningham and 460 Media. 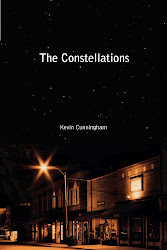 KC is author of The Constellations and Home Ice: Confessions of a Blackhawks Fan and editor of Slightly Better Trivia: Crazy Apes.